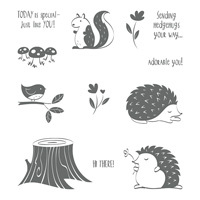 Hedgehugs Clear-Mount Stamp Set by Stampin' Up! Awww, how cute are these hedgehogs? And the bird, and the squirrel, and even the mushrooms! Simply a must have for your all-time cuteness collection!